The ZFL-272VH+ is a broadband amplifier that operates from 0.03 to 2.7 GHz. It delivers a gain of 17 dB and a P1dB of 30 dBm at 1 GHz. 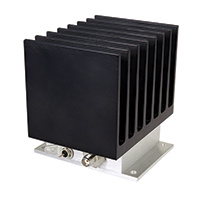 This reverse voltage protected amplifier is available in a module with an integrated heat sink. The ZFL-272VH+ is ideal for CATV, LTE and base station infrastructure applications.